Raphael helps uprooted persons fleeing terrorism in Nigeria and needs land for agricultural training. Summary: During the last nine years, nearly two million persons have fled their ancestral homes in northeastern Nigeria trying to escape the terrorists. These refugees have lost their homes and everything they owned. There is widespread hunger and lack of basic needs. They have escaped with only their lives and are desperate because they cannot take care of themselves or their families. Raphael’s development group, BACCOT, has already been working with these refugee families. With the help of SIFAT donors, 6.5 acres of farmland have been purchased. 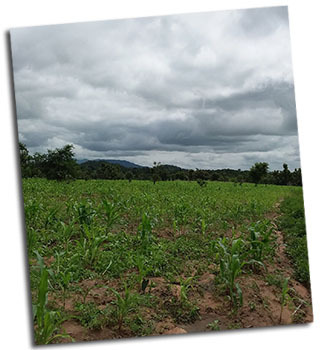 Raphael will use this land to teach the men how to farm, which gives them the opportunity to raise food to feed families with surplus to sell. Pray with us for Raphael and his wife Helen as they work with refugee families both spiritually and physically, helping them to leave their bitterness, anger, and hurt in the hands of Jesus and rebuild their lives. It will be a great day of rejoicing for these desperate families when they can work again to supply their own basic needs. Will you help Raphael buy an additional 4.5 acres of farmland to provide a work place for these long-suffering refugees?